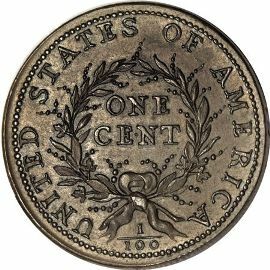 Wreath Cents - Strike two for the U.S. Mint! Wreath Cents were the second attempt by the U.S. Mint to find an acceptable design for this denomination. 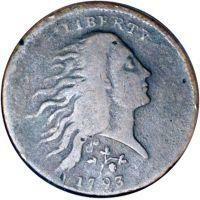 Along with the Chain Cents, this liberty coin also met with much public dis-approval. exists called the "strawberry leaf" variety. Approximately only four or five examples are known and all are in below average grades. The reverse of these copper coins show a wreath appearing to be made of laurel to the untrained eye. However, the wreath has thin twigs jutting out from it with berries on them. This characteristic would be very different from that of a laurel one. It is unlikely that anyone knows what plant David Rittenhouse had in mind. It is perhaps a combination of many different types of foliage. Edge: Bars and Vine, or ONE HUNDRED FOR A DOLLAR followed by one or two leaves. 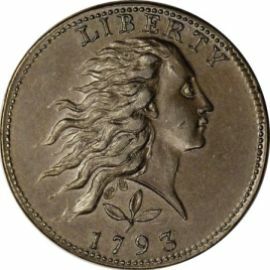 Pictured at left is an example of the "Strawberry Leaf" variety of this denomination. Notice the difference in the sprig between liberty and the date. 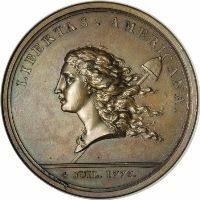 Approximately 4 or 5 of these coins are known to exist making them a very highly prized possession for coin enthusiasts. of these coins are very similar.